Tommy Gauthier (born in Joliette, Quebec) was just 14 when he discovered his passion for music.He started by playing the drums, an interest that was soon overtaken by violin. Drawn in at first by traditional Québec folk tunes, he later broadened his scope by exploring folk jazz through exposure to artists like fiddler Mark O’Connor and jazz violinists Jean-Luc Ponty and Didier Lockwood. All of the music he listened to, regardless of genre, drove him to perfect his technique. 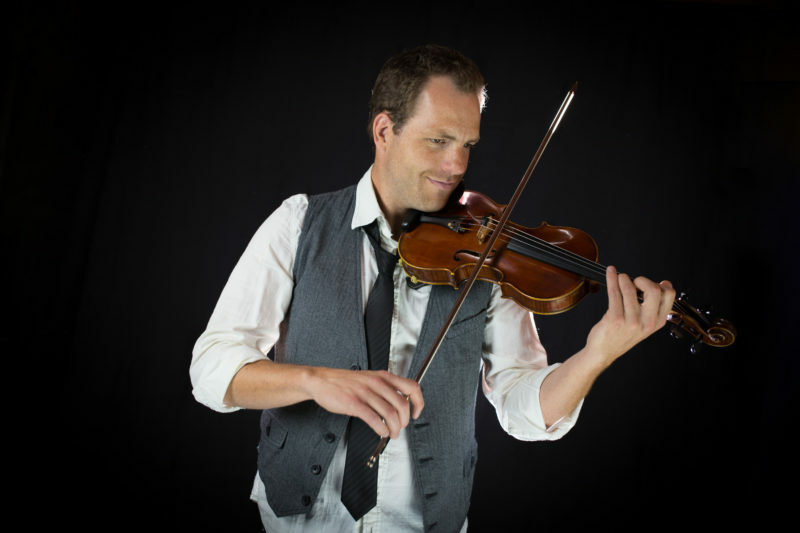 Tommy was the first student to follow an unconventional violin program at Cégep de Joliette, and later at the University de Montréal, where he has now been teaching music since 2006. Throughout the years, Tommy has been involved with multiple bands, including trad bands Matapat and the Yves Lambert Trio, singer Roch Voisine, and fingerstyle guitarist Antoine Dufour, all of which helped him to develop his own unique style that features his remarkable improvisational skills. After mastering violin, he learned to play mandolin and bouzouki, becoming a highly versatile multi-instrumentalist who moves easily between traditional and more modern interpretations. His impressive track record has led him to record several albums with a variety of artists and he has toured extensively in North America and Europe with Yves Lambert, Andrée Watters, and Roch Voisine. Tommy has also performed with renowned guitarist Antoine Dufour. In 2013, he played alongside Yves Lambert and Olivier Rondeau for a special event with the Montréal Symphony Orchestra, directed by Kent Nagano. Tommy was part of the folk opera Les Filles de Caleb, Roch Voisine‘s Americana tour, Richard Desjardins‘ L’Existoire tour, and more recently, Robert Charlebois’ 50 Years – 50 Songs tour. A consummate perfectionist, Tommy navigates multiple genres with ease thanks to his versatility, agility and musicality, but remains firmly grounded by his Québec roots.